Discussion in 'TV Talk' started by Revoltingest, Apr 14, 2019 at 8:06 PM. While the ruling class is mesmerized by a TV show, the proletariat continue with their preparation knowing that, for a time, their efforts will go unnoticed. I still haven't seen GOT, and from what I am told its illegal to watch it alone. It can get you arrested. Isn't that right? This is how one makes an entrance when politics is to be conducted. I prefer the Sloth method of entering the scene! With great actors and other staff, the Author and Directors make a traumatic, PTSD producing debacle of it all. Before it started was a commercial for a Deadwood movie. The movie format just seems too small for such big series as these. That deserves so many likes, funnies, winners, etc., and of course we can't do that! Well played, my friend, well played indeed! The White Walkers from north of the wall.....do they represent Trump? 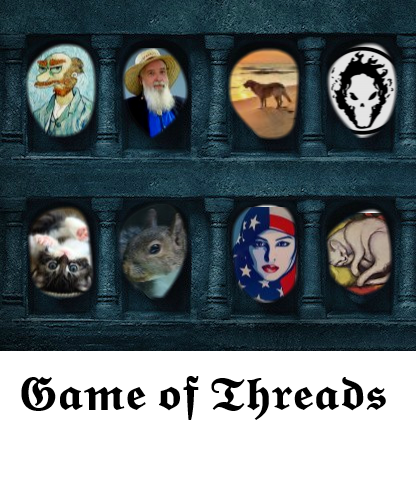 Game of Threads, Season 1, Ep.1: Wirey is Coming. I hope I'm right an Jamie is the ultimate hero of whatever of the series. I'm sure your vote has absolutely nothing to do with his level of his hotness.. He is hot, but my thinking that isn't based in it. As far as the Lord of Light prophecy goes, I think his hand was his first sword being broken where he was reborn "between salt and smoke" in the bath scene with Brian), his second sword when he freed Tyrion (tempered in the blood of a lion), and the third (tempered in the blood of his lover) I think will be Cersei. Which means Jamie will kill Cersie, which of course Cersie is prophesized to die at the hands of her valunqar, and given the shows subtle foreshadowing it has been pointed out a few times Cersei is older than Jamie. And the High Valarian words for Lord of Light and Golden Hand are close enough it's easy to confuse the two across translations and wear to tablets/etchings. And Jamie is clearly featured in the wall painting in the cave where John and Danny find the dragon glass.